It’s no secret patent-related legal disputes have become the subject of most media coverage lately…Whether it’s Apple halting sales of Samsung’s tablets, HTC going after Apple, or Google snatching up Motorola to beef up their patent portfolio, it’s clear the company with the most patents will have an advantage over others in the legal proceedings that we’re bound to continue encountering down the road. This is why we’re intrigued by the graphic above (via GigaOM) from mobile analyst Chetan Sharma charting the number of issued patents (in the US and Europe) between 1993 and 2011. 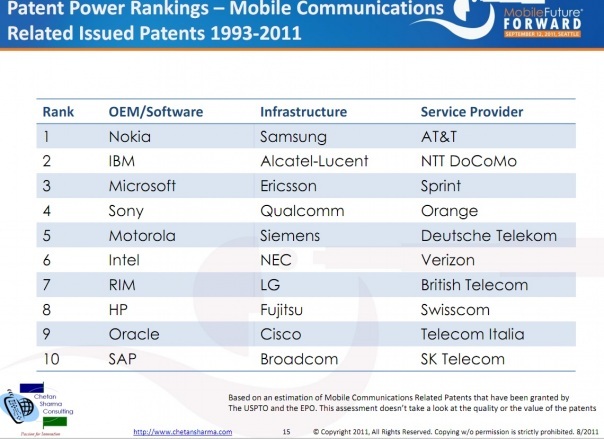 While these estimates of mobile communications related patents don’t take the quality of patents into account (which is obviously a huge factor in determining their long-term value), you can see from the breakdown below that Nokia and Samsung top the list, with the other expected players including IBM, Microsoft, Sony, Motorola, and Intel following. Noticeably far down the list is Apple, the one company who seems to have had more success than others fighting patent-related issues recently. Again, these numbers in no way represent the quality of patents and the ability for companies to protect their IPs in the courtroom… which is also a good indication that perhaps we should be looking more closely at the quality of patents rather than the sheer number. Recently patent expert Florian Mueller took to Twitter following the Google/Motorola acquisition saying he “would caution everyone against overestimating the strength of Motorola Mobility’s patent portfolio,” he continued, “Apple and Microsoft sued Motorola Mobility anyway”.